The barista pours ground coffee onto an extremely fine filter atop a piston that descends into the machine. After the coffee steeps, the piston rises, creating a vacuum that pulls water through the grounds. The finished coffee flows through a spout into a waiting cup. Despite its price tag, a Clover can increase cafe ownersâ€™ profits by allowing them to charge more per cup according to the bean. The follow video from Wired shows the process, CHOW have more details about the process. I love French Press coffee and this machine will be interesting, the question is how soon until the local Starbucks in Saudi Arabia use it? They have increased their prices by 2SR last year so they better do it. I will be watching this Find a Clover map and hopefully one will appear in Saudi Arabia soon. 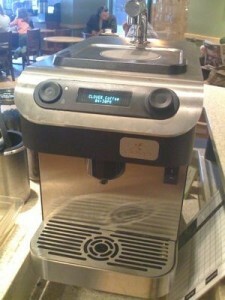 Links of interest: The Coffee Fix: Can the $11,000 Clover Machine Save Starbucks?, Clover FAQ. Review: Clover – The Best Single Serve Coffee Machine for CafÃ©s, Clover Equipment. I would hope that local Starbucks would do the same, 12SR per hour for a crappy Internet connection (the Internet timer doesn’t work on non IE browsers, so if you used Firefox or, like me, a Mac, then you cannot logout to resume it later!). There’s a slight catch to the free WiFi deal: you get two hours free, but only if you buy coffee with a Starbucks card. This doesn’t sound like a total scam to us, though: just put your coffee money on a gift card instead of handing it over directly. After the first two hours, you can get additional hours at a rate of $3.99 for two, and the unlimited monthly plan is $20. If you’re already an AT&T customer, you can log in and use the new Starbucks hotspots for free. I don’t mind getting an hour or two of Wi-Fi access with my 19SR drink, I think I deserve it. Via DownloadSquad.